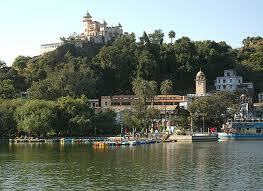 Mt Abu is the only hill station of Rajasthan. Spread all along a 2 km long plateau, Mt Abu is situated at an altitude of 1220 m above the sea level and is the highest point on the Aravalli Ranges. Mt Abu literally means the 'Hill of Wisdom'. The Nakki Lake is in the center of the hill station. The lake derived its name from the legend that the gods dug out the lake with their nails. Only 3 km to the north of Mt Abu is the Adhar Devi Temple. It is an ancient temple dedicated to Goddess Durga and built in a natural fissure in a rock. The place also offers a splendid view of the Mt Abu. Mt Abu is also famous for the Dilwara Jain Temples. These temples are amongst the best specimens of Jain architecture in India. The façade the temples are usual though the interiors are extravagantly carved on white marble. The temples date back to the 11th and 13th century. The Vimal Vasahi Temple and Tejpal Temple are the most impressive. Brahma Kumaris Spiritual University and Museum must also is visited. 15 km from Mount Abu is the Guru Shikhar, the highest point in Rajasthan. Achaleshwar Mahadev Temple dedicated to Lord Shiva is at Achalgarh, 11 km from Mt Abu. Mt Abu Wildlife Sanctuary is 8 km from the main town. It is home to species of birds, panthers, sambhars and wild boars. By Air: The nearest airport is at Udaipur, 185 km away. By Rail: The nearest railhead to Mount Abu is at Abu Road, which is 29 km away. Abu Road is connected with both Ahmedabad and Jodhpur by train. By Road: Mount Abu is well connected by surface network with Jodhpur, which 264 km away and is connected to all the major cities in Rajasthan. Best Tour Packages offers tour booking and tour packages for Mt Abu, Rajasthan. To book a tour or for more information, please fill up the form below. Copyright © Best Tour Packages. All right reserved.